We are happy that Summit Securities is getting listed today after a lot of persuasion. Summit Securities is part of the RPG group and is a finance company holding shares of group cos of RPG group. The company got created on the merger of five similar finance companies – CHI Investments, Summit Securities, Octav Investments, Brabourne & RPG Itochu (unlisted). 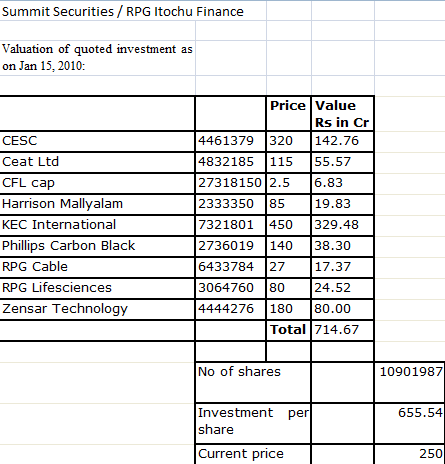 We have been tracking Summit Securities as we had recommended CHI Investments, which got merged on 2 February 2010. Post re-structuring the equity of the company is 10.90 Crore. 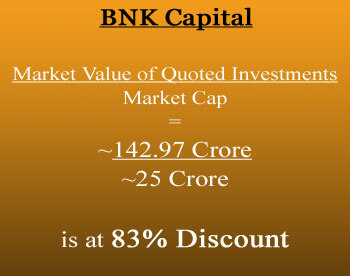 BNK Capital is a small finance company with experience of over several decades. The company provides brokering services across the various products such as equities, commodities etc and serves several HNIs and corporates. At CMP of about 42, the co’s own Mcap is close to 25 Cr while the value of marketable investments on Balance sheet is 143 Cr!! Hence the company is available at a discount of 82.65% to the value of investments. Similar valuations were once found in CHI Investments too, which was then our favorite and yielded very good returns. Yes, many of the similar finance companies trade at discounts to their market value of investments, but such discounts are usually not more than 30-35%. Here we are getting a company at 83% discount. RPG group has proposed the merger of the listed finance cos viz. CHI Investments, Summit Sec, Octave Investments, Brabourne Ent with RPG Itochu Finance. As per the preliminary analysis, I feel the scheme and ratios are unjust to the shareholders of CHI Investments. 1) RPG Itochu Finance Ltd shouldn’t be a blank company i.e. it should offer value equivalent to the value being offered by the merging companies. Explanation: We have been informed that RPG Itochu is having equity of close to Rs. 5 Cr without having any significant operations, assets or profitability on balance sheet. If so, it will reduce the current value of the merging companies by 50+%. The logic in all these four cos is: They are just holding cos, so the best way to value them is – consider the market value of investments they have and consider the exchange ratio accordingly, while RPG is trying to give benefit to Summit Securities which has the least value (refer column F below) among all the four listed companies. 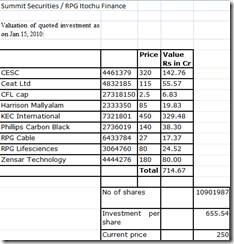 Cost to shareholder in new co. This is a clear case of unjust value erosion to the shareholders of CHI Investments. We should take the matter to the company and SEBI etc. If the management’s intention is to just consolidate the cos into one company, why merge these into RPG Itochu?? Why not merge the other 3 companies into CHI Investments which itself is listed on both BSE & NSE. At the bare minimum, they should revise the swap ratio for shareholders of Summit Securities to 1:56 from 1:16 (Logic: CHI holds value 8.07 times while Summit has value of only 2.31 times so swap ratio for Summit should be 2 times more than current ratio). Ideal swap ratio for Summit Securities should be 1:40, if swap ratio for CHI is 1:06, to bring the shareholders to the same level. Management should provide details on RPG Itochu and the rationale for these swap ratios. If the swap ratio gets corrected it will result into value-unlocking for CHI Investments. All calculations have been done considering RPG Itochu finance to be a new company created for the purpose of merger or having a very small equity capital. I haven’t considered the value of unlisted investments in the above companies (they are less than 10% of the total investments). Haven’t considered the impact of merger of Instant Holdings with KEC, which is a subsidiary of Brabourne Enterprises. P.S. There were few updates on the Value of investments in the companies the effect of which has been updated on 26th July 09. UPDATE: The most important question in this amalgamation scheme is – What does RPG Itochu Finance Ltd has to offer ? As per recent updates, it has been known that RPG Itochu Finance Ltd is having an equity of close to 5 crores with no significant operations. If so, then this merger will reduce the value of merging companies by 50+%. The effect of the same is not reflected in the tables above.